I thought this was interesting - shortly after teabagger Christine O'Donnell won the Delaware GOP primary, Palin offered some advice to the victorious candidate while appearing on fellow Fox News' talking head Bill O'Reilly. "She's gonna have to learn very quickly to dismiss what some of her handlers want. Remember what happened to me in the VP. I used to have to sneak in my phone calls to you guys to say, 'Hey, I'm here,' Palin said. "She's gonna have to dismiss that, go with her gut, get out there, speak to the American people, speak through Fox News, and let the independents who are tuning into you, let them know what it is that she stands for, the principles behind her positions." That was on September 15th. What would make Palin quickly change her opinion? Would it have anything to do with O'Donnell canceling her appearance on a couple Sunday shows, including one on friendly Fox News, because of a recently released video showing O'Donnell talking about her "dabbling" into satanic witchcraft as a teen? You know, I have a different take on this. Right away after winning the primary, O'Donnell was willing to go on all kinds of different shows in the National Media. And immediately the press and others started talking about how O'Donnell was younger, fresher looking, AND she was better able to express herself and not afraid to go on other National Media besides Fox News. She booked the weekend shows and Sarah emerged on Fox to advise O'Donnell not to listen to her handlers, and to get her message out on Fox. But I don't think this is because Sarah cares about how well O'Donnell does, but because momentum was already building that O'Donnell actually was better able express herself, and more importantly, brave enough to face the national media. It took a little while before O'Donnell canceled her weekend show appearances. I'll bet Sarah was sweating bullets wondering if O'Donnell would agree to huddle back into her campaign and not talk to the media other than Delaware campaign appearances. Palin even repeated her "advice" to O'Donnell,because I think it is pretty important to the old gal that she not be further shown up by Christine O'Donnell. Fortunately for Palin, O'Donnell has now stopped with her National Media appearances. I wonder who convinced her to do so. She seemed fearless enough to keep on talking to the press, unlike the cowardly, supposed fierce "Mama Grizzly" Sarah Palin. 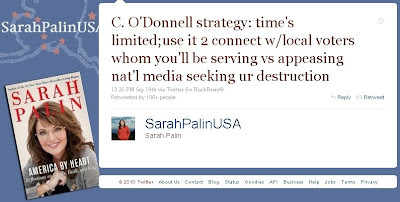 If O'Donnell kept talking to the press, the fact that even such a dingbat as O'Donnell could still present herself far more coherently than Grandma Palin would have soon become abundantly clear to all but the thickest Palinbot. 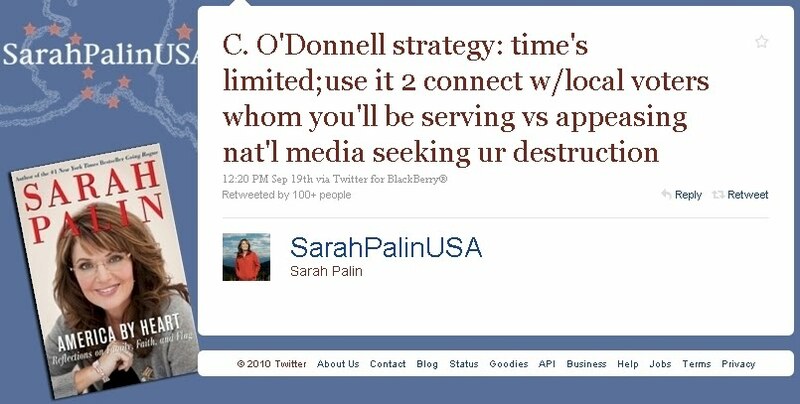 Sarah's advice to O'Donnell was really self serving, to keep herself from being overshadowed by O'Donnell. But many people have already made the comparison. Sarah must know she's on borrowed time now. Sarah's just parroting Karl Rove's advice, given on Fox Sunday. Did her handlers sit on her again? Hmmmmmm!